Similarly, John Gay’s 1728 piece, The Beggar’s Opera, was predicated upon the contrasts between Augustan poetry wit and sentimentalism. The fact that unique social hierarchies and codes of comportment governed the criminal underworld and the lower social classes. Gay satirized not only the pretensions of then-current lyric opera, but also the assumptions of the upper class regarding the behavior of their socioeconomic subordinates. Although The Beggar’s Opera is harshly satirical, it is, like Pope’s Dunciad, based upon Gay’s perception of deep rifts in British society. While many of the characters are more caricatures than finely-drawn, realistic portraits, Gay injects sincere emotion into the unfolding drama, particularly in his portrayal of the limited social choices and roles available to women in the eighteenth century. In this way, the play embodies the double-voiced discourse that characterizes many texts from this era. 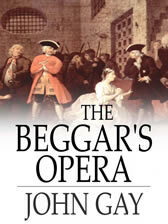 Paper Masters writes custom research papers on The Beggar's Opera by John Gay.